Japanese Indigo, Polygonum tinctorium, is sometimes known as Dyer’s Knotweed. The traditional source of blue dye used to colour Japanese clothing. 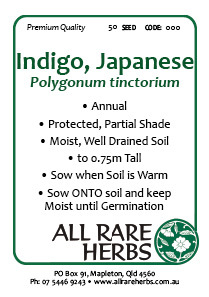 Japanese Indigo prefers moist soil in a protected and shaded position. Annual to 75cm. Pink or white flowers. Be the first to review “Indigo, Japanese seed” Click here to cancel reply.